As Aurora owners we surely pay due respect to Carroll Shelby. His legacy as a champion driver, team manager, visionary and philanthropist defines a life well lived. His legal efforts, however, to suppress proliferation of replicas of the Cobra racing cars he created remain to this day, blunting the vision of many replica builders who see their work more as a tribute to him. 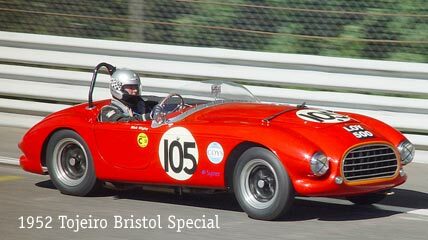 However obvious the Cobra look of their sports cars, Aurora Cars Limited, like Shelby, drew styling ques from earlier roots. 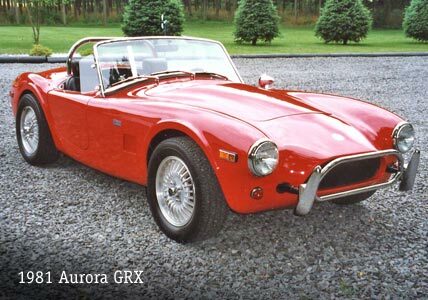 Aurora never used the name Cobra and never set about to build a racing replica. The Aurora was engineered as a pure sports car, and it is with this notion we look here at its lineage from the style and engineering perspectives. John Tojeiro was a gifted engineer who built racing specials as a sideline to his small business in painting and repairing bodywork. 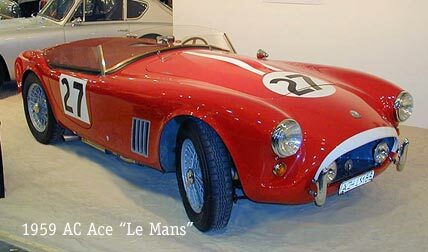 In 1952 in England, he was commissioned by Cliff Davis to design a new race car with a light weight tubular chassis. 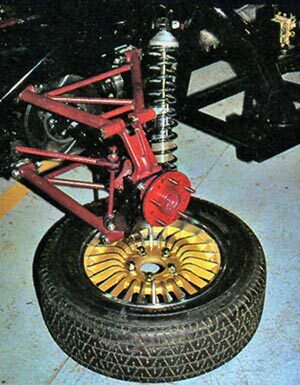 It would be fitted with a 2-liter Bristol engine positioned well aft of the front wheels for optimal balance. 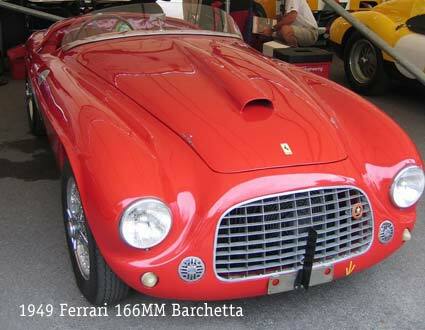 The body would be styled after the little Ferrari 166MM and 212 "Barchetta" from Touring of Milan. 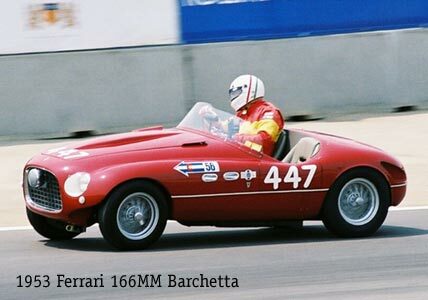 (The Ferrari 166 was named for the cubic centimeters displacement for each of its 12 cylinders, putting out 140HP). This two seater was fabricated by Gray and Rich Panelcraft in Hammersmith, licensed LOY 500 as a "Tojeiro-Bristol" in 1953. Davis enjoyed a successful racing season that year in his new car. Tojeiro was soon commissioned by Ernie Bailey to build a similar car, but fitted with a stronger Lea Francis engine. Eventually Bailey and Vin Davison introduced Tojeiro to AC, whose chairman Charles Hurlock quickly took the car into production. 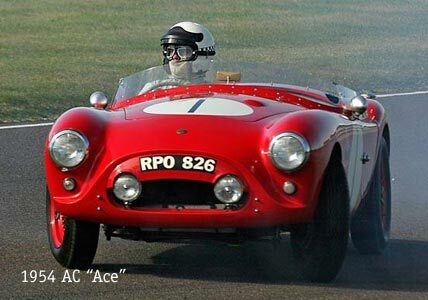 Bailey purchased AC in 1953, and his newly named AC "Ace," a car very similar to the Tojeiro-Bristol was warmly received at the London Motor Show in 1953, with sales of 147 cars to follow. Before the 1954 London Motor Show the body was redesigned by Alan Turner, with headlights and tail lights raised to meet export requirements, and, like the Tojiero Bristol Special, retained the four-wheel independent suspension. 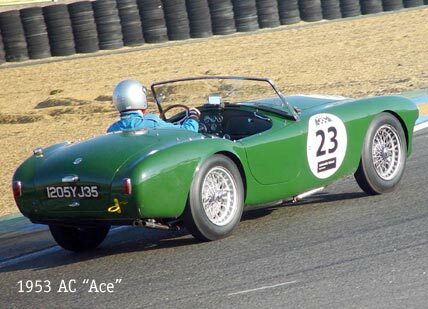 In the late 50s the AC Ace would place among the top ten finishers at LaMans, with the earlier but more powerful Bristol 1991cc six cylinder engine.The body style remained unchanged through the 1950s as the Ace enjoyed increasing popularity in club racing. In total about 735 Aces were built up to 1963, some 47 with the heavier and weaker Ford Zephyr engine. 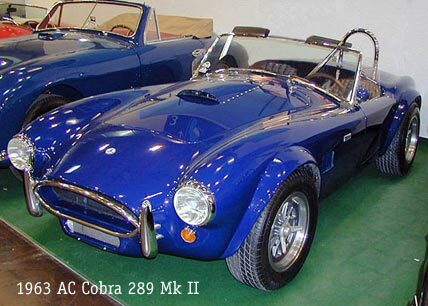 AC officially stopped production of the Ace in 1963, and began producing the AC Cobra for UK and Europe, while producing Shelby Cobras for US export. Now 1961, with sales dwindling, AC was approached by Carroll Shelby with the idea of building 100 cars with small block Ford V-8s in order to qualify in production class racing. Several other manufacturers in the UK were also approached with the idea, but declined. Ford stepped up and offered the new 221 cubic Inch V-8, soon punched out to 260c.i. producing 260hp. 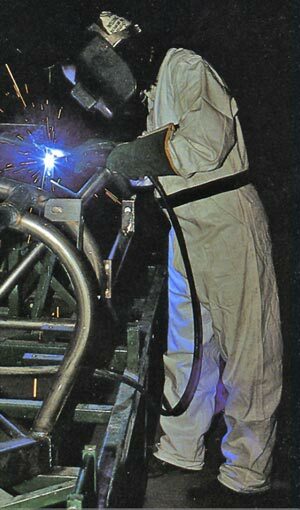 AC partly owned a sheet metal factory which supplied the skin, and by 1962 a prototype without the powertrain was completed and transported to the US. 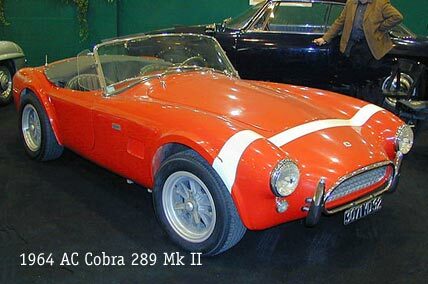 By early 1963, 75 of Shelby's "Cobra" cars were sold for street and racing. By June that year 125 had been built, the 50 latest featuring the Mk II improvements including the 289 cu V-8, improved cooling with side vents, rack and pinion steering, and other handling improvements. Many 1962-63 "Mk I's" were updated to these Mark II specs, blurring the change-over point from Mk I to Mk II. Shelby knew racing was key to improving performance and reliability, and 1963 the lighter Cobras placed 1 and 2 at Riverside, beating the new Corvette Sting Rays by a large margin. Note the dramatic difference in tire width, from high speed Le Mans racing to US short track acceleration demands. The standard 1964 Shelby Cobra 289, weighing in at 984 kilograms, or 2214 lbs, accelerated from 0-60mph in 5.5 seconds with a 15.3 mpg burn rate. 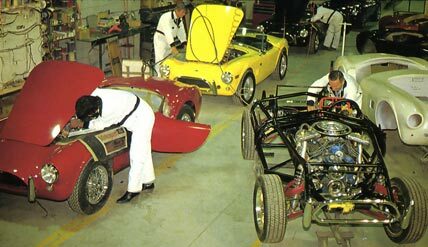 A total of 580 AC Cobra Mk II's were made for Europe and the US, with 65 as pure racing cars, or prototypes. 61 were right hand drive for the UK market. The 1964 AC Cobra Mk II has evolved to the shape familar to Aurora owners in most every detail. Aurora manufactured replicas of the 1964 AC Cobra in exacting detail from 1981-1983 under original ownership, delivering between 157-170 exquisite cars (some later delivered partially completed). 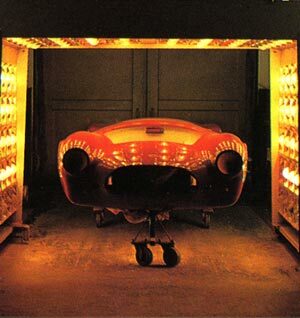 With 450 man hours in each car, the Aurora was uniquely manufactured in many ways. With dual plane tubular space frame, four wheel independent suspension and disc brakes (inboard rear for less unsprung weight), Salisbury (Jaguar) differential, luxurious Connolly leather interior, Smiths guages, five layers of wet sanded acrylic laquer and even air conditioning, the Aurora had no equal. It was the only replica subjected to the rigors of US DOT specifications and trials and EPA compliance. In 1981 this meant crash testing, elaborate emissions supression, 5-mph bumpers, side marker lights, steel reinforced doors and much more. Every Aurora was delivered street legal in 50 states, an achievement unique to Aurora Cars Limited among replica manufacturers.